I sense that Kenya needs a confident and resilient Quaker presence and that Friends there need to be equipped to live bold and spiritually grounded lives.Click To TweetIn November, four Woodbrooke tutors travelled to Kenya to support Friends in their explorations of Quaker roles, processes and leadership. Whilst Britain Yearly Meeting is already actively working in the country on peacebuilding projects involving local partners, I am told that we are the first British Friends to work collaboratively in this way with both Friends Church Kenya and Friends United Meeting African Ministries Office. 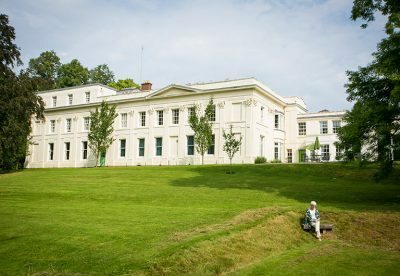 It is a testament to Woodbrooke’s international reputation that we were approached by these two umbrella organisations and invited to support them in their work revitalising the meetings under their care during a time of great change. In the coming weeks, we will share some of the insights we gleaned from our experience in more depth, but in this short post I’d like to briefly explain a number of the highlights of the trip. On arrival in Kakamega, a town in western Kenya just north of the equator, we were greeted with songs and garlands by the children’s meeting of Friends Church Handidi. This was our first experience of what I’ve since learned is the characteristic warmth of Kenyan hospitality. Later on we were to join them in vibrant and joyous worship filled with song and dance. I was struck by the difference in style and tone to the stillness of expectant waiting so typical of Quaker meetings in Britain. It makes one realise that often our definition of what constitutes Quaker worship can be too narrow. Amongst the leadership of the numerous Yearly Meetings in Kenya – to date there are 19 of them – there is a deep hunger to understand the spiritual roots of our Quaker processes. Just as British Friends have recognised the need to reacquaint themselves with their Book of Discipline, so too have their counterparts in Kenya. While much of what we explored with them is already contained within their bilingual English/Kiswahili Christian Faith and Practice there was much reflection on how well known and understood its contents are amongst the membership, and how faithfully it is being applied. With this in mind, we looked at the spiritual underpinning of servant leadership, good stewardship, clerking, eldership and oversight. Kenyan Friends were interested in how Threshing Meetings and Clearness Committees could be used to discern the rightness of their decision making and help them better deal with issues of internal conflict. In recognising that, as leaders entrusted with authority by all church members, they are stewards of a dynamic, living tradition, they reflected on how such processes might sow the seeds of growth; making space for a contemporary Quakerism that is more relevant to their context to emerge. This means finding a balance between remaining faithful to tried-and-tested ways, and being courageous enough to adapt to the needs of changing times. For instance, rising literacy levels and improvements to the country’s communications and banking infrastructure are presenting new challenges for their clerks and treasurers. All of this will require the recognition and nurturing of the many spiritual gifts which exist within their community, especially those of women and young adults. One Friend spoke of the need to ‘build up and flex our spiritual muscles’ if Quakers are to remain a vibrant and significant presence in Kenya. 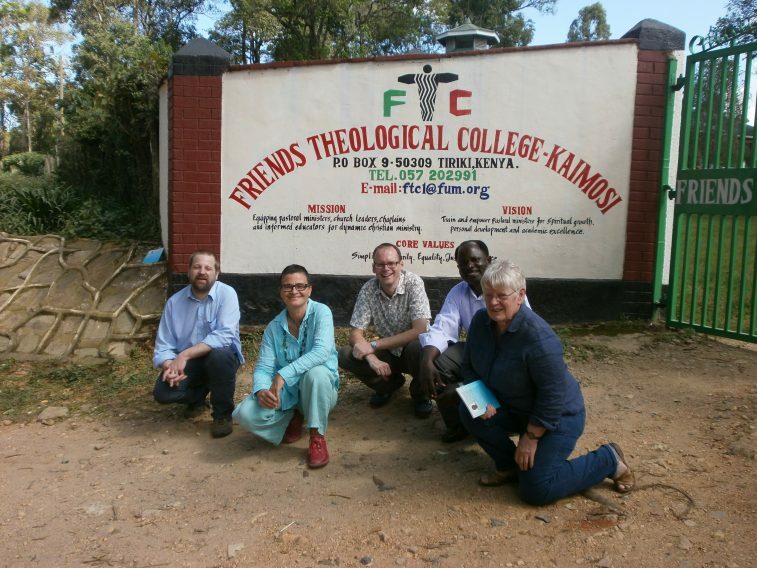 Woodbrooke tutors pose outside Friends Theological College with the Principal, Robert J. Wafula. A further highlight included our visit to Friends Theological College in Kaimosi. 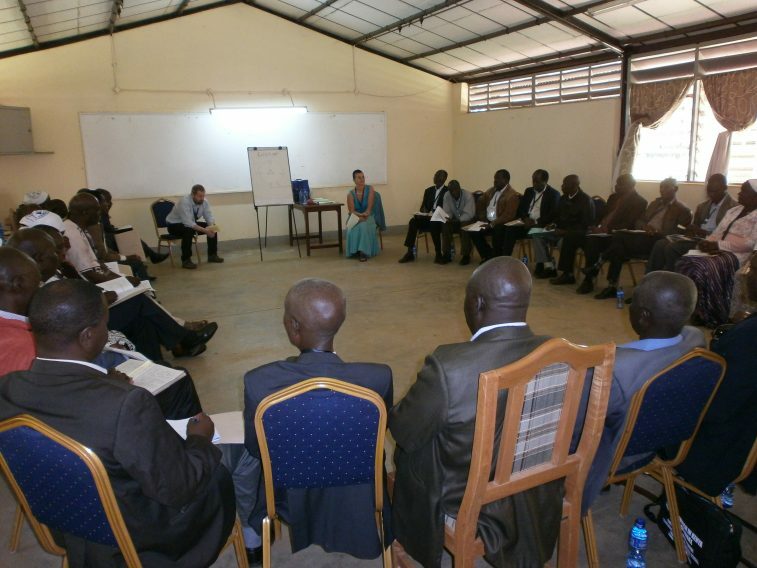 This is a training centre for Quaker pastors, chaplains and educators and is unique in Africa. It was interesting to learn of their authentic commitment to sustainability and to reflect on how their work might be an example to Quaker institutions throughout the world. Another high-point was in hearing of the work of the Friends Church Peace Team who did much to alleviate the impact of the violence surrounding the 2007 elections. It was especially pertinent to learn of how this work continues to this day, as our visit coincided with a time of great political sensitivity where the threat of tribal conflict loomed large. We will share more of these two experiences in future posts. Whilst I am all too conscious of the environmental impact of this trip, and of the sensitivities surrounding Britain’s colonial past, I am also aware of how beneficial it is to engage with Friends throughout the world. Over the course of the week we helped to cement working relationships that I hope will continue for many years to come, and it is gratifying to know that Woodbrooke has played a small part in helping Kenyan Friends to strengthen their church during a time of political anxiety and the threat of civic violence. Now more than ever, I sense that Kenya needs a confident and resilient Quaker presence and that Friends there need to be equipped to live bold and spiritually grounded lives. Deep Roots for Strong Communities – how do we nurture the people who serve our meetings?